Added Onto Lifetime Shed Orders! This item is currently free under our shed promotion. When you add a qualifying Lifetime shed to your cart this item will appear in your cart free of charge. 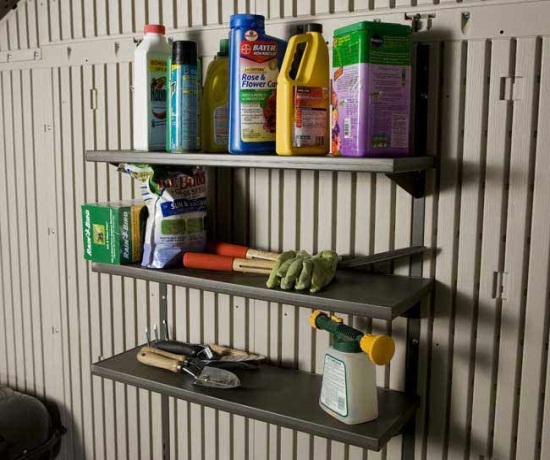 Product: Lifetime Shed Accessories - 0130 3-Piece 30" Shelf Accessory Kit for Lifetime Sheds. Please note that this shelf accessory is compatible with 7' 8' 10' 11' & 15' Lifetime sheds. 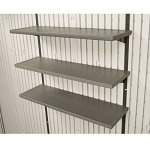 These Lifetime Outdoor Shed Accessories are 30 inch shelves that replace the older 32 inch shelves that were discontinued by the manufacturer Lifetime Products. These shelves will fit Lifetime 8 ft outdoor storage sheds. 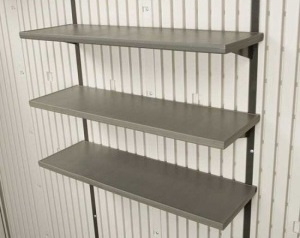 Easily add more storage to your shed with these 30" shelves. Please check out our entire line of Lifetime Sheds. Great addition to my new shed! I liked the shelving that came with my Lifetime shed so much that I ordered additional 30 inch shelves. Its true that the lower shelves are a bit harder to install, since I had to get on my knees to do it. However, the results are well worth the inconvenience. It is perfect to have this item, makes your shed looks even better when you have those extra shelves. Needed more shelves for my 8x15 shed and these were the obvious choice. Easy to install and work great! Great way to organize shed; increases capacity considerably. Installs easily. Strong unit. Good productss -- as advertised. Ordered another set of 3 shelves and a long 8' shelf. 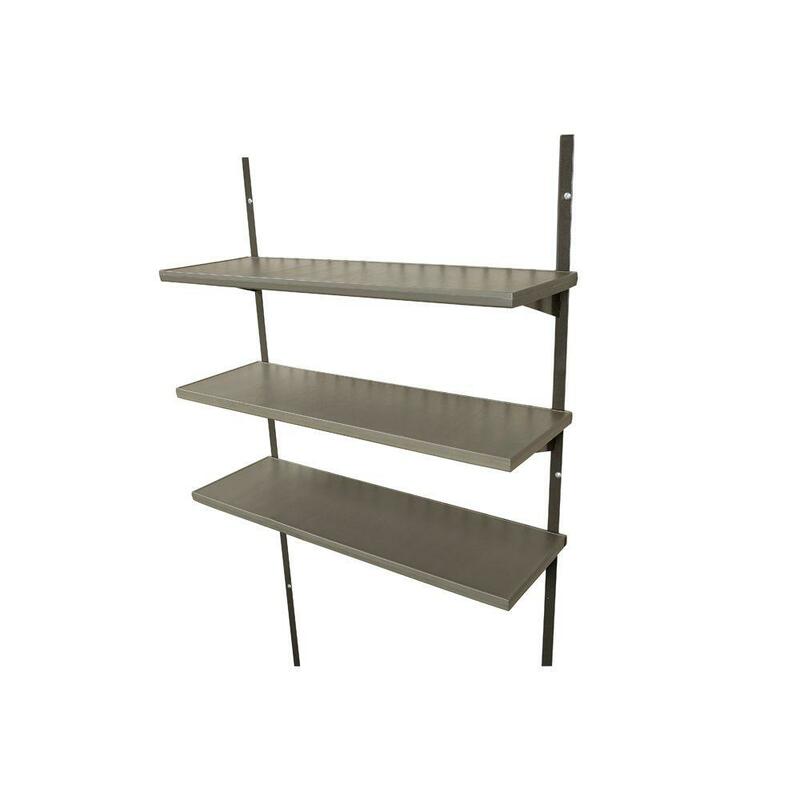 Q: Can these shelves be installed on a side wall instead of the back wall? A: Yes, as long as the wall has the channels you can install it. A: Are the wall channels available with the shelves 8 x15ft sheds from Comp edge? Q: what is the finish size of platform where the floor lays on ? 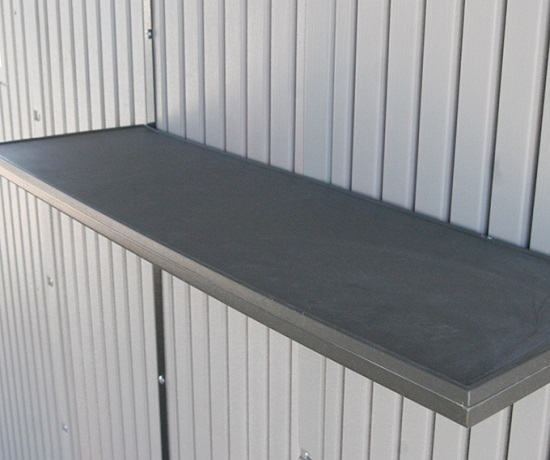 A: This is not a shed, but is an accessory shelving for the storage shed. If you let me know which size of storage shed you are considering I can tell you what size of platform you need. Q: says product works with 7' sheds, then in another place says only compatible with 8' and up, I have 7x7 shed and need shelving for this size shed can you help? A: It does work with the 7 foot sheds. Sorry for the confusion. Q: What is the weight capacity of each shelf? A: Each shelf will hold 50 lbs. Fast Shipping: Orders for the 0130 Lifetime Shed Shelving 3-Pack for 7, 8, 10, 11 & 15 ft Sheds generally leave the warehouse the next business day. Dimensions: 70" x 11" x 3"